As the new school year moves near, many parents are left with the age-old struggle of how to get their child to brush their teeth regularly before heading off to the bus stop each day. The good news is that for those parents who put in the effort, their kids will usually develop good oral hygiene habits. Prior to the school year beginning, parents can start working on helping their child develop good daily brushing habits. Teach them why. Discuss the reasons why they need to brush regularly, so they know why they are doing it. You can make this easier and still keep it age-appropriate by picking up some kid’s books about brushing, too. Make it fun. When parents make brushing time fun, little kids are more likely to want to participate. Have a brushing song or fun routine that goes along with getting the job done each day. Give them rewards. Kids love to get rewards, even if it’s a sticker added to their sticker chart. Once they meet their brushing goals, take them to the store to pick out a book. This will help to keep reinforcing the habit. Praise their efforts. Rather than focusing on what they fall short of or miss, stick to keeping it positive and giving kudos for the parts they do well. They can always go back and improve areas missed, but positive reinforcement goes a long way. 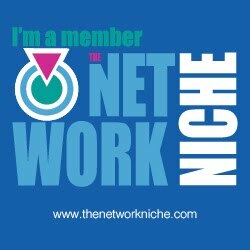 Help and hold accountable. Up until kids are around 8-9 years old, parents may need to keep going into the bathroom with them to ensure proper brushing is being done. While it may seem like a pain, it’s helping them to establish lifelong habits that will benefit them greatly in the long run. Another issue that parents should be aware of with school coming back is fluorosis, which is marked by changes in the appearance of the tooth’s enamel. According to the Centers for Disease Control and Prevention (CDC), children eight and under are at risk for the condition, because they still have adult teeth under their baby teeth. Dentists such as Dr. Sharp are warning parents to avoid fluoride for their children because of the potential health risks, as well as fluorosis. Common sources of fluoride, according to the CDC, include toothpaste (which also come with a fluoride warning label right on the label), drinking water that has been fluoridated, and other oral hygiene products, such as mouthwash. They also recommend that parents not allow children to swallow toothpaste that contains fluoride, yet they advise that unintentionally swallowing it can lead to a greater amount being ingested than intended. Dr. Sharp, however, recommends that parents avoid fluoridated toothpastes altogether in an effort to remove the risks associated with children ingesting fluoride. 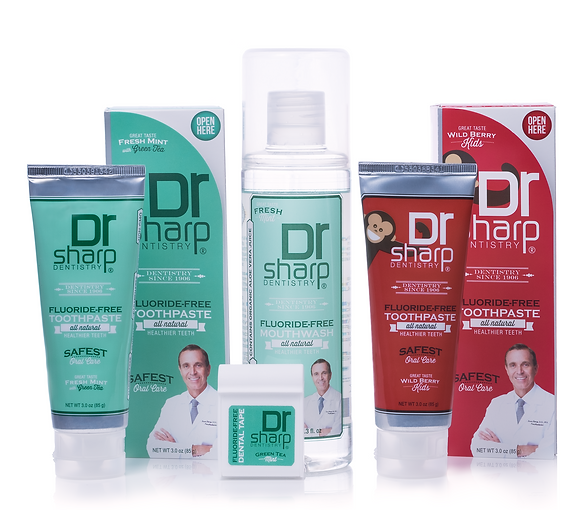 Dr. Sharp Natural Oral Care now offers their product line in small, convenient travel size options. His product line includes children’s toothpaste, adult toothpaste, fresh mint mouthwash, and dental tape. All products are safe to use, made in the USA, and are gluten-free, have no artificial colors or flavors, are vegan, non-GMO, alcohol-free, fluoride-free, and cruelty-free. Plus, they help whiten teeth and have xylitol, which is a natural sweetener that also helps to fight off cavities. The products are safe for the entire family. 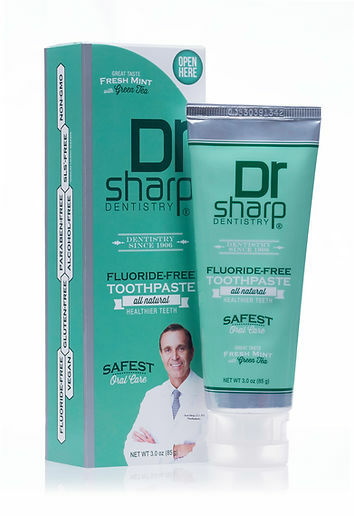 To learn more about Dr. Sharp Natural Oral Care products or see where they can be purchased, visit the site at: www.drsharpcare.com. 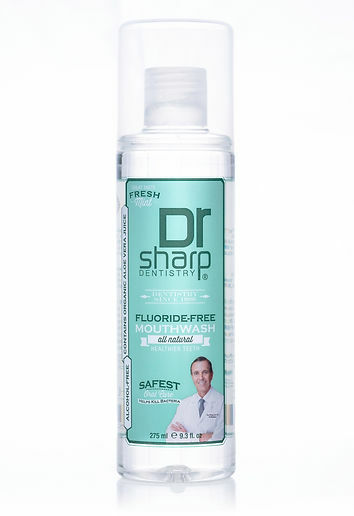 Dr. Sharp Natural Oral Care is a line of natural oral care products that were created by a fourth-generation dentist. All products are made from natural, safe ingredients, and are made in the USA. The product line includes toothpaste for children and adults, mouthwash, and dental tape. For more information, visit the site at: www.drsharpcare.com. Follow them on Facebook and Instagram @drsharpnaturaloralcare. 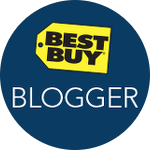 Cassandra's Review- The toothpaste and mouthwash are easy to use and did not burn my mouth. I like that the products are more natural and do not have a horrible taste.